7th Annual Frosty 5km!! New location! Help celebrate the end of the running season by joining your friends and fellow runners in a fun 5 km run and run for a good cause. Registration: Begins at 10:15 a.m.
Prizes & Chili: Predict your 5k time! Three prizes for three individuals that run nearest to their predicted time, (no watches permitted :-)). Stick around after the run for some snacks and a bowl of chili. Please help fight community hunger. Bring non-perishable fooditems* to the run OR make a cash donation. Collected food and money will be donated to the Ottawa Food Bank. Did you know: The Ottawa Food Bank provides emergency food to 45,000 people a month – 37% of those being children. With its food industry partnerships and bulk purchasing power, the OttawaFood Bank turns every $1 donated into $5 worth of food into the community. **Most needed items: canned meat & fish, canned vegetables & fruit, cereal (whole grains), cooking oil, dry pasta & sauce, baby diapers, baby formula, juice (boxes or cans) legumes(canned or dried), macaroni & cheese, peanut butter, personal hygiene products, rice, snacks (think nutritious) and soup. A sincere thank you for attending (or supporting) the Swanky Soirée Fundraiser in support of Life is a Good Run. The evening was enjoyed by all, complete with wonderful food, live music by Brian Letourneau, the Capital Roadrunner Choir debut and the good company of Capital Roadrunners members and many friends. A silent auction and rousing tooney auction led by the vibrant Qi Wang, contributed to the success of the fundraiser, raising more than $4,200 for Life is a Good Run (there are still a few dollars to collect before a final tally is recorded). A warm thank you to all of the many businesses and individual donors for their very generous donations. Please support these establishments throughout the year and tell them that you heard about their generous donations at the Annual Capital Roadrunners Swanky Soirée. Many thanks from the Capital Roadrunners Fund Raising Committee, Suzanne Hotson & Qi Wang & Life is a Good Run. What is "Life is a Good Run"? For the past few years the Capital Roadrunners have held a successful and entertaining fundraising event. This year we have chosen to support Life is a Good Run. This local organization inspires people to run for mental and physical health and was created by one of our very own Capital Roadrunners. We asked Life is a Good Run founder and CR member, Suzanne, to tell us more about the group and her vision for it. Check it what she had to say below and think about how your life is a good run. If you have not picked up your ticket for the Swanky Soiree please follow this link for more information. I am in the process of starting a non-profit business called Life is a Good Run. For the past two years I have been delivering Learn to Run clinics at Amethyst Women's Addiction Centre and in the past year I started the program at Salus (a home for people with mental illnesses). The clinics have been successful and my goal is to offer a more structured Run Clinic for additional marginalized community groups at no cost. I envision creating a program with a team vibe, supplying team running gear, with the ultimate goal of passing on clearly defined skills that promote the overall well-being of participants. Learn to Run Clinics use running as a means to demonstrate valuable life skills in addition to the obvious physical and mental benefits of being active. By applying practice, patience, perseverance and discipline, participants discover that running 5 km is an achievable goal. Improved self confidence and self-esteem are evident. Transferring these valuable life skills to other areas in their lives provides an even greater opportunity for positive outcomes. 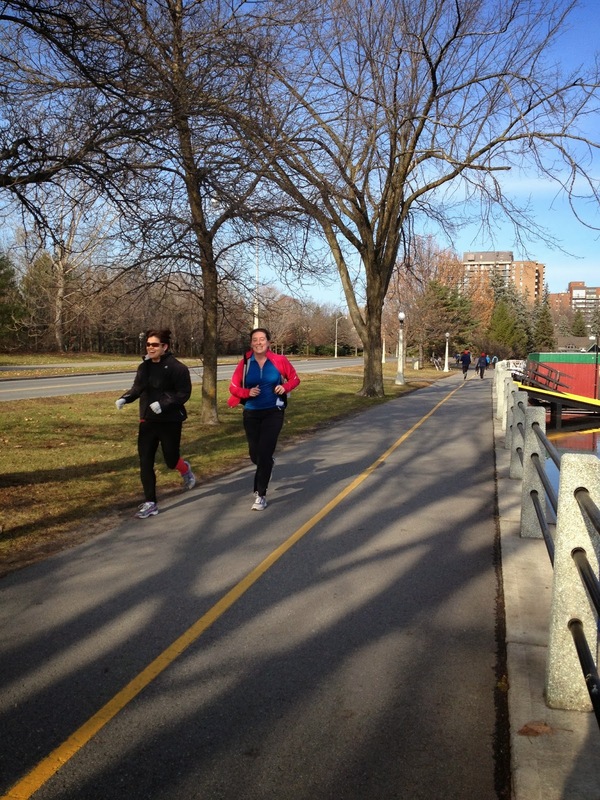 The clinic meets weekly for eight to eleven weeks leading up to a 5 km race event. With the motto "slow & steady", we begin the program with 1 min walk/run repeats. Each week we increase the time spent running versus walking. Participants commit to run on their own twice during the week (for a total of three run practices per week). Each session begins with a brief talk (running tips, clothing, nutrition, motivational tips, check-in). Participants run/walk for 24 to 50 minutes as the program progresses. Each session concludes with a stretching session and during the course of the clinic we introduce basic core strengthening techniques. One of the integral pieces of the program is that participants receive an email after every session to recap what they have accomplished (distance covered) and to remind them what homework they have for that week. I also include a summary of running tips or whatever points were covered that week. During the goal 5 km race event, experienced runners from the Capital Roadrunners volunteer as pacers to accompany and motivate individuals to complete the run so that they cross the finish line with a smile on their face and feeling good. We are looking at exciting improvements to how the clinics are delivered, such as creating poster boards tracking mileage of individuals, honoring milestones reached, distributing team branded running gear, and increasing the number of supervised running sessions to motivate participants to train three times per week. We are in the process of forming a strategic alliance with the Canadian Cancer Society to assist participants that want to quit smoking. We will strive to continually improve the overall well-being of all participants in the Life is a Good Run - Learn to Run Clinics. Fundraiser Soiree for "Life Is A Good Run"
Continuing our tradition of fundraising for worthy causes, this year, the Capital Roadrunners will be supporting "Life is a Good Run", a non-profit organization being founded by our very own Suzanne Hotson to help individuals learn to run. The goal is to develop transferable life skills through running, such as practice, patience and perseverance. We've all experienced the benefits of running (improved self confidence as well as physical and mental health), so we thought it'd be fitting for us to raise funds to help enable others. For those who attended the last couple of years, you know what to expect. For those who did not, we hope to wow you! Tickets are $30/person. Space is limited, so please purchase your ticket soon during one of the Capital Roadrunners' practices by speaking to Suzanne or Qi or by emailing lifeisagoodrun@gmail.com. In an effort to be green, we will be issuing electronic tickets only. Significant other/friends are welcome! So, chase away the winter blues, shed your running gear, put on your swanky outfits and come out to support an amazing cause! Questions? Contact Qi at qi.wang@nrcan.gc.ca. Help celebrate the end of another amazing running season by joining your friends and fellow runners in a fun 5 km run along the canal. Everyone is welcome! Registration begins at 09:15 at Lisgar Colegiate just before the race. Prizes will be given to the individuals with the 3 closest times! Stick around after the run for some snacks and a bowl of chili. Please help fight community hunger. Bring non-perishable food items* or a cash donation to the run. Collected food will be donated to the Ottawa Food Bank. The Ottawa Food Bank provides emergency food to 45,000 people a month – 37% of those being children. With its food industry partnerships and bulk purchasing power, the Ottawa Food Bank turns every donated into $5 worth of food into the community. *Most needed items: canned meat & fish, canned vegetables & fruit, cereal (whole grains), cooking oil, dry pasta & sauce, baby diapers, baby formula, juice (boxes or cans) legumes (canned or dried), macaroni & cheese, peanut butter, personal hygiene products, rice, snacks (think nutritious) and soup. Check out iRun Radio this week!! Help celebrate the end of another amazing running season by joining friends and fellow runners in a fun 5km run/walk along the canal. Everyone is welcome - bring your friends! Prizes will be given to the individual with the 3 closest times! Stick around after the run for some snacks and a bowl of chili. Request: The event is sponsored by the Capital Roadrunners. by bringing non-perishable food items* to the run. Collected food will be donated to the Ottawa Food Bank. * Most needed items: canned meat and fish, canned vegetables and fruit, cereal (whole grains), cooking oil, dry pasta and sauce, baby diapers, baby formula, juice (boxes or cans), legumes (canned or dried), macaroni & cheese, peanut butter, personal hygiene products, rice, snacks (think nutritious) and soup.